Tag Archive | "Gutzon Borglum"
The Secret of Mount Rushmore Revealed! Each monument and every large project of any type has its stories to tell. In the case of Mount Rushmore, a mammoth undertaking 14 years in the making, there are many stories. One little known story, however, is how the project brought together a renowned, French-trained, American sculptor and an unknown, but very talented Italian immigrant whose hand refined and nuanced the image we see today. Mount Rushmore, along with the many works of art that depict America, stands out as a symbol of the first 150 years of a new nation. 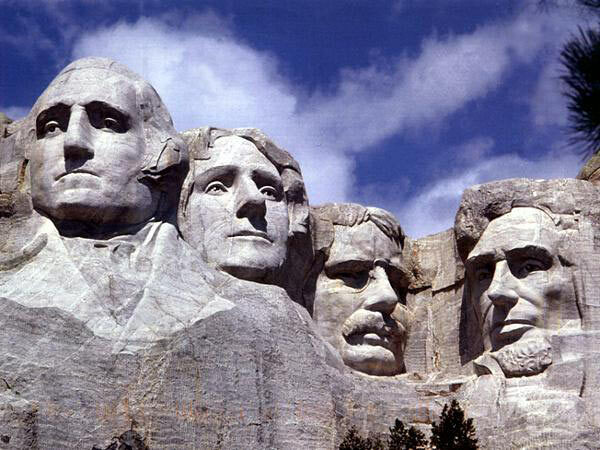 Carved by (John) Gutzon de la Mothe Borglum, the massive likenesses of Washington, Jefferson, Roosevelt, and Lincoln look down on the visitor’s center of the Mount Rushmore National Memorial, near Keystone, South Dakota. Born in St. Charles, Idaho on March 25, 1867 to an immigrant Danish woodcarver, Borglum later in life studied art and sculpture in Paris, France. During his sojourn in France, he met Auguste Rodin, the creator of works such as The Thinker, and was influenced by Rodin’s genius. Returning to New York City, Borglum began his career as an artist and sculpter. In 1901, he became the first living American sculpter whose work was accepted by the prestigious Metropolitan Museum of Art. He was also honored with the Logan Medal of Arts for some of his portraits. Borglum’s passion was to create art depicting American achievements. Across the Atlantic Ocean, Vincenzo and Osvalda Del Bianco, on their return cruise from the United States to Italy, welcomed son Luigi on May 18, 1882, as the ship sailed into the port of Le Havre, France. As a small boy at home in Meduno, Pordenone, Italy, Luigi watched his father carve wooden figures; fascinated, he took up the art himself. Vincenzo noticed the boy’s talents and encouraged him. At the age of 11, Luigi accompanied his father to Austria, to learn the art of stone carving from master craftsmen. After two years in Vienna, Luigi returned to Italy, where he completed his studies in Venice. When Luigi turned 17, he received a letter from his American cousins in Barre, Vermont, telling him of the need for stone carvers in America. Boarding a ship in Naples, Italy, he sailed to America for a new life in a new land. In 1913, World War l erupted and Luigi returned to Italy to fight for his country. After the war ended, he returned to Vermont and in 1920, settled in Port Chester, New York, where he met and married Nicoletta Cardarelli. This would prove to be pivotal point in his life. Nicoletta’s brother, Alfonso Scafa, introduced Luigi to Gutzon Borglum, and thus began a friendship that lasted until Borglum’s death in 1941. Borglum quickly recognized Luigi’s talent and affectionately nicknamed him “Bianco.” In 1920, Borglum enlisted Bianco’s help in carving the Governor Hancock Memorial on Stone Mountain, Georgia and the Wars of America Memorial in Newark, New Jersey. In 1933, Borglum hired Bianco as chief carver to supervise the Mount Rushmore project, a major undertaking that would last fourteen years. Bianco’s specialty was refining the President’s facial features in the granite after they had been shaped crudely by dynamite. During the construction, Borglum often praised Bianco for his expertise and dedication to making Mount Rushmore a work of art. One of the problems that arose during the sculpting was Jefferson’s nose, which revealed a large crack in the stone. But with Bianco’s expertise, the face was shifted, placing the crack on Jefferson’s lip. The lip was then filled in with granite and pinned in place, thus making the repair barely noticable. Bianco also put his deft touch on Lincoln’s eyes. Although Borglum wanted to craft monuments made by Americans with American themes, he realized that the Mount Rushmore Memorial would never have been completed in accordance with his vision without the aid of an Italian immigrant.